New Yorkers are saving billions of dollars a year thanks to the historic 2011 state law capping annual growth in local government and school property tax levies. The cap, enacted on a temporary basis and extended in 2015, was made permanent as part of the fiscal 2020 state budget, after Governor Andrew Cuomo announced he would not agree to a budget deal without it. Since its enactment, the cap has weathered near-constant criticism from representatives of government employee unions, municipal governments and school districts, who portray it as improperly hindering their ability to raise taxes. Their (so far) unsuccessful efforts to undermine the cap have ranged from lawsuits challenging its constitutionality, to legislation creating loopholes under which taxes could be increased, to proposals that would eliminate the 60 percent supermajority requirement for overrides of the cap by school district voters and municipal governing boards. For a comprehensive explanation of how the law works, download the Empire Center’s Citizens Guide to the Tax Cap. Here is the complete statutory tax cap language. Background information and tax cap implementation data from the Department of Taxation and Finance is available here. 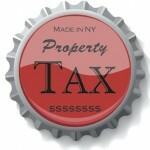 The Office of the State Comptroller offers links to further information on the property tax cap on this page.